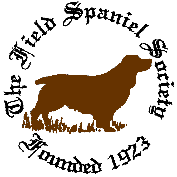 The Field Spaniel as a minor breed at times gets confused with and thought of as a large Working Cocker Spaniel or a Springer Spaniel, they are neither they are very much a separate breed. They are known for been calmer than both the Cocker or Springer Spaniel. They are still very much a dual purpose spaniel, which means you can work them through the week and show them at the weekend during the shooting season. Training your Field Spaniel starts as with all dogs at an early age with basic obedience: sit, stay, heel, fetch and of course recall find a local training club as not only does this help you with basic training it also helps socialise puppy which is also very important. Keep the training sessions short so the young dog doesn’t get bored and always end on with a favourite activity so that both you and the dog are happy and he will see his training as fun you can also start to introduce the Gundog whistle. Gundog training at around 6 months old and around then look around for a local Gundog club that may hold training sessions through parts of the spring and summer months. Training a Field can seem slow compared to training some of the other working spaniel’s, they can be stubborn and wilful but they are also very willing to please. They do not react well to been shouted at and any form of harsh treatment, all that does is make them withdraw into themselves, so you need patience and sometimes a little more patience and a good sense of humour but once trained you won’t have a better companion to take with you on a shoot. 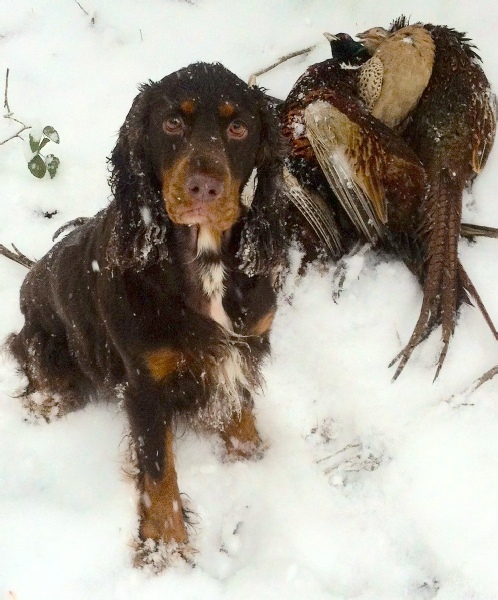 The Field Spaniel can and does both air and ground scent equally well and many gundog people who don’t know the breed will think they are not working because their heads are up however this is far from the case at times they seem to find more birds when air scenting. 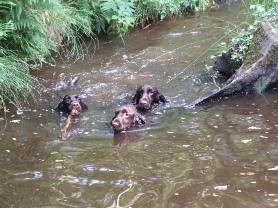 They will face and push through the thickest cover and love to retrieve from water. It’s true that on the whole they do have a slower working pace than the Working Cockers and Springer Spaniels they don’t charge about, they are methodical in their work but they find and flush birds the others miss with their faster pace. Working Tests are held by minority breed clubs in different locations around Britain, they are set up to show your dogs ability if he were working, except there is no game as they are held in late spring and through to the early autumn. Instead of game, canvas dummies or dummies covered in rabbit skin are used and only blank shots from a starting pistol. However your dog will still be expected to listen to commands, hunt and retrieve as if on a real shoot under the watchful eye of a judge. They are good for the young dog waiting to go on his first shoot and the older dogs to keep them keen. The people who run them and take part are always happy to help and offer advice. Field Trials are very different from working tests they are held on live game. The dogs have to work in front of a line of guns ( the people who shoot the birds) they flush the birds, sit, the guns then shoot the bird and dog retrieves the bird to the handler, all this is done over the watchful eye of a judge. Working Gundog Certificate is similar to a Field Trial (although some are now held only using dummies). If you show your Field and one day hope for a full Champion the Working Gundog Certificate is something you need to pass.